Stevens affirms life by acknowledging the inevitability of change, established by the ceaseless passage of time, and by celebrating human existence while recognizing the paradoxical positive and negative effects suffering exerts on individuals. Eliot frequently concentrates on the inevitability and instrumentality of suffering — its unique power to shape an individual’s character into someone who “fructifies in the lives of others.” Thus, he too maintains the same foundation of unconditional embrace and joy. 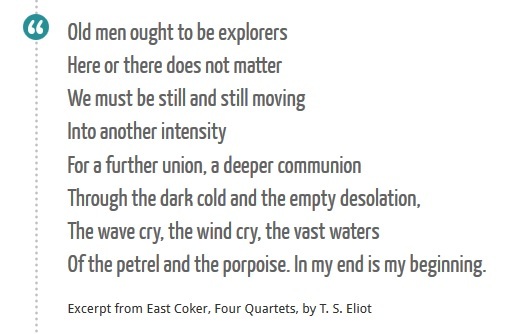 In Four Quartets, I contend that Eliot affirms life by proclaiming that individuals must be fully engrossed, including mind and body, in the immediacy of each successive moment, regardless of whatever potential threats it may pose. .... In short, Stevens faults the pressure of news and excessive reliance on history for obscuringthe fundamental innocence of existence, and the constant transformation it experiences.For Stevens, if humanity recognized this innocence and inexorable change, they would insert themselves into the natural process of affirmation embodied by the earth; they would constantly seek new experiences and revitalizing resemblances. For Eliot, the fear and anxiety of living in the present — of not knowing the future — blocks affirmation. I am going to try read this thesis in more detail later since Four Quartets is one of my, if not THE favorite poem, and Wallace Stevens is most definitely a poet whose work I keep returning to time and again, as I wrote here. But for now, here's one lovely excerpt from each of those two poems. First, one of the parts from Auroras of Autumn, a poem with which I am not as familiar as I am with Eliot's Four Quartets. And then to pick an excerpt from Four Quartets, which is really difficult given how much I like this poem and how many different lines from it I have excerpted and quoted in years past.... so, maybe the best thing to do is to just randomly pick one of them!